In this video we will discuss the use of FromBody and FromUri attributes. Let us understand their use with an example. Consider the following Put() method. This method updates the specified Employee details. If you are using Fiddler, the PUT request is as shown below. Notice the Id of the employee is in the URI and the employee data is in the request body. At this point if we execute the request, the employee data is updated as expected. Now let's include the Id as a query string parameter. In the first request Id is specified as part of route data. Notice in Fiddler we have included id parameter as a query string. When we execute this request, the update succeeds as expected. 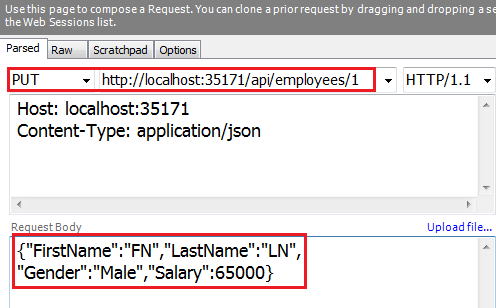 When a PUT request is issued, Web API maps the data in the request to the PUT method parameters in the EmployeesController. This process is called Parameter Binding. Now let us understand the default convention used by Web API for binding parameters. So in our case, the id parameter is a simple type, so Web API tries to get the value from the request URI. 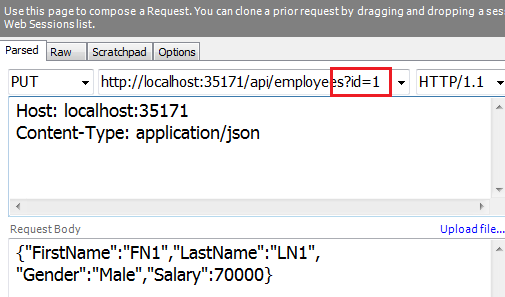 The employee parameter is a complex type, so Web API gets the value from the request body. Noor, I too faced the same issue. We need to Add the Verb types in the appliction config file, as the default HTTP Verbs are Just GET,HEAD,POST,DEBUG. So to allow Delete and Put Verb we need to Add Verbs in the File. To do that .. Open Run Command and Paste the following path. There you will see Application.config file. Open it and modify bellow name Value Property Verb Values as Shown Below.